The Carefree Cruising “flexible weeks cruising” allocation scheme is unique. It has been designed for those people who know what time of year that they want to take their main holidays in, but who don’t want to, or can’t, take the same fixed weeks holidays each and every year. It also allows those dependent upon school holidays to also use their boat when they need to. It is based upon buying “blocks” of time, either two weeks (1/24th share), four weeks (1/12th share), six weeks (1/8th share) or eight weeks (1/6th share). Many people want to use their boat during the summer months of June, July and August (the weeks shown coloured Red on the calendar below). Others prefer to cruise in, April, May, September and October (the weeks shown coloured Yellow on the calendar below). Our scheme allows you to choose when you want to take your main holiday and then you will continue with this choice throughout your ownership of the boat. The “Blue” weeks are for winter cruising and maintenance. 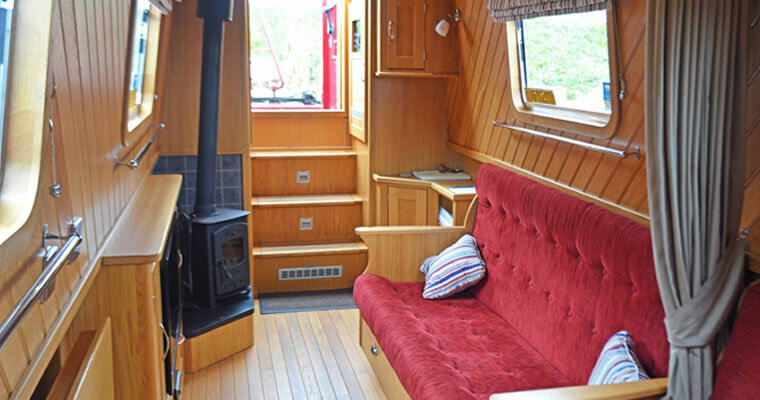 If you own a 4 week (1/12th) share, our scheme will allow you to use your boat for 2 weeks together (3 weeks for a 6 week (1/8th) share and 4 weeks for an 8 week (1/6th) share) without having to swap weeks with your co-owners. The calendar below shows the colour allocated to each week of 2016, with each week starting on a Saturday. The actual week commencing (the turn-around or change-over) day may vary depending upon which marina the boat is based at. The number and seasonality of the “Red”, “Yellow” and “Blue” weeks will be the same each and every year. And if you own a 4 week (1/12th) share, you will be able to cruise for three weeks in the season every year, guaranteed plus you will also have the use of one winter week! Q: When do you want your "Summer" (or main) holidays to be? If you want your “summer” holidays on your boat to be in the months of June, July or August, then you must buy a “Red” share. If you would prefer your “summer” holidays on your boat to be in the months of April, May, September or October then you must buy a “Yellow” share. A “Red” share is more expensive than an equivalent “Yellow” one. “Special “ Red shares are available that give school holiday entitlement. Q: How many summer cruising weeks do you want? The next decision that you need to make is how many summer weeks cruising you want to do. Do you want one week, two weeks, three weeks or four weeks? Each summer week’s cruising needs to be balanced with an “other” week – this allows the boat purchase and running costs to be fairly spread over all of the owners. Your “summer” weeks will be designated the colour of your choice of cruising months (“Red” for June, July or August and “Yellow” for April, May, September and October) and your “other” weeks will be taken in the “Red” and “Yellow” weeks not used by the other owners for their summer weeks, plus the weeks shown as “Blue” in the calendar above. This is explained more fully below where we show how your usage entitlement is allocated. If you purchase a 1/12th ( 4 week) share, you will always get to use your boat in three Red or Yellow weeks – meaning that every year, you have three weeks in – season cruising, guaranteed! Q: How are the weeks allocated between owners? School holiday shares are available for those that need them. The allocation process for these is explained in a separate section below. Your “summer” “Red” and “Yellow” weeks are allocated first. For each colour, the owners pick according to a rotating preference list. Owner 1 picks first, Owner 2 second and so on. For the following year, the owner that picked first for each of the lists goes to the bottom of the list and everyone else moves up one. For the “other” weeks entitlement, the picking order of the owners is reversed, so that those that picked last first time round, pick first for the remaining weeks. “School holiday” shares do not carry any preference for the picking of their one remaining “other” week (their “blue” week). The first owner in the “Red” list picks first, followed by the first owner in the “Yellow” list, second owner in the “Red” list, second owner in the “Yellow” list, third owner in the “Red” list, etc. A 1/12th share owner picks one week from the remaining “Red” and “Yellow” weeks and one week from the “Blue” weeks. A 1/24th share owner picks one week from the “Blue” weeks only. Q: How many "red", "yellow" and "blue" weeks will I get each year? Q: What if I can only use the boat in school holidays? We offer school holiday shares specifically for those people who need to use their boat in the school holiday periods. The following describes the system for English and Welsh school holidays. Other educational institutions can also be accommodated within our system (please ring for details). The equivalent of three “Red” 1/12th (4 weeks) shares are designated as “school holiday shares”. These owners have priority in reserving their “summer” “Red” weeks, plus one of their “other” weeks – but only for recognised school holiday dates. These are typically the last full week in July, the week that straddles July and August, the first four full weeks in August, the week that straddles August and September and Whit week, which are designated as “Red” weeks in the calendar shown above, Easter fortnight and October half term which are shown as “Yellow” weeks on the calendar above and Christmas and New Year weeks, which are shown as “Red or Yellow” on the calendar above. A “School Holiday Share” owner will be able to take three of their four weeks in school holiday periods. Owner 1 will pick first in year one and will reserve two of their four weeks, which can be in any of the weeks mentioned above. Owner 2 and Owner 3 then pick their two weeks. The picking order then reverses for the reservation of the “other” weeks. Owner 3 will then reserve one of their “other” weeks first from the remaining school holiday weeks. The only proviso is that no more than two of the three weeks booked can be “Red” designated weeks. (e.g. you can have two “Red” weeks and one “Yellow” week, one “Red” week and two “Yellow” weeks or three “Yellow” weeks – but not three “Red” weeks – this is to be fair to the other owners). Owner 2 and Owner 3 then reserves their third week. It is not usually possible to allocate your remaining “other” week (i.e. your winter “Blue” week) in school holiday periods. We do not charge extra for “school holiday” shares, either in purchase cost or annual running costs. Shares can be designated “school holiday” right from purchase, but this status can be released in future years or requested in future years (subject to availability). A 2 week (1/24th) School Holiday Share is also possible. This works by “sharing” the yellow week between two owners, meaning that a week at Easter or October Half Term can be taken every second year, in addition to a week at Whit or the main summer holiday period every year. Q: Why can't I just purchase my summer weeks? The purchase and running costs of your boat need to be spread fairly over all of the owners. There is no such thing as a “free lunch”. Some boatshare schemes allow you to purchase “summer” weeks only. But in reality, what this means is that they have spread the cost of the boat, and the running costs that you pay each and every year, over a smaller number of weeks. You will often see phrases in these schemes that say something like “our costs are calculated on the assumption that we sell 34 weeks”. What this means is that the purchase and running costs of the boat are spread over these 34 weeks – meaning that you are still paying for the ‘unsold’ 14 weeks of the year, without having the opportunity to use the boat in these weeks if you want to! Q: Do I need to use my winter "Blue" week(s)? No. The best way of looking at these is as a “bonus”, as they are used to spread the purchase and running costs fairly over all of the co-owners. It’s not unusual for the owner of a 1/12th share (for example) to actually only use the boat for three weeks of the year. Q: Can you explain that to me again? If you don’t fully understand the allocation system after reading this, don’t worry. The system is actually quite simple, but like most things, it’s easier to explain verbally than in writing! Please just ring us on 01270 760 770 and we’ll happily talk you through it. We’ll even ring you back if you want! I loved my two days on Jenny Wren so much last month I don’t want to wait till the end of the summer for my next go!